Our ½ bath downstairs had a lot going for it and yet, a lot to be desired when we first moved in. The shutters, which covered every window all over the house, had to go. They made the tiny bathroom so much darker. The old laminate floors were replaced with a synthetic tile – it has a little give to it, which I like. The removal of the shutters and use of the frosted glass-like window cling obscures the window without losing daylight. 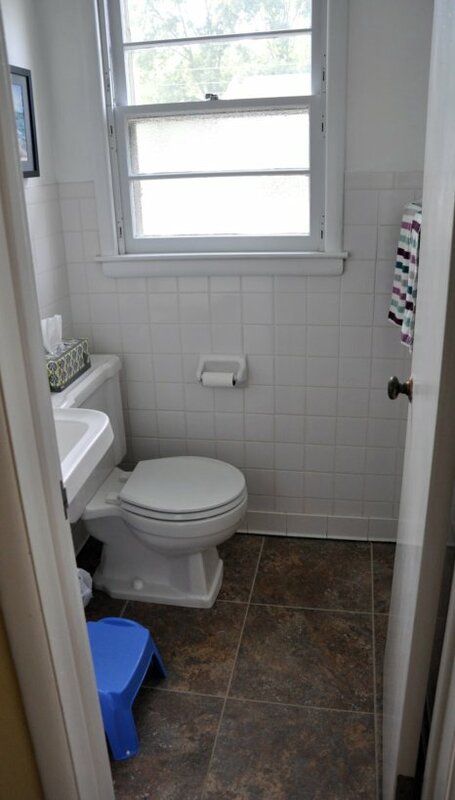 This bathroom’s window helps to light the hallway, so this was the better choice than blinds or curtains. 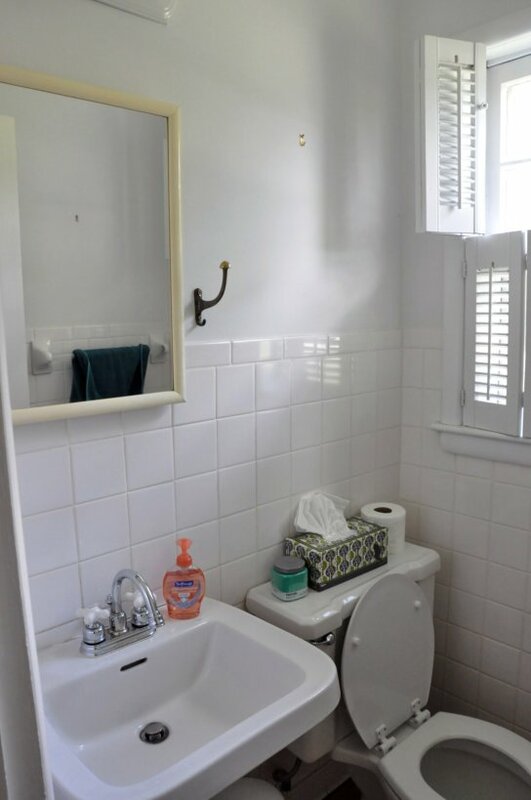 The tile is in fine shape, but the paint needed a fresh coat of glossy white. After the floor was changed out, we had to raise up the pedestal sink a bit, and then re caulk the sink to the wall. That crazy hook had to go as well. It was much harder than we realized to find a new cabinet, due to the size and shape of the hole in the wall behind it. You can see the crack in the tiles in the bottom left corner of the cabinet, above. So, we opted to use living room paint and some paint samples to spruce it up for the time being. Who knows, it may even become a permanent cabinet. 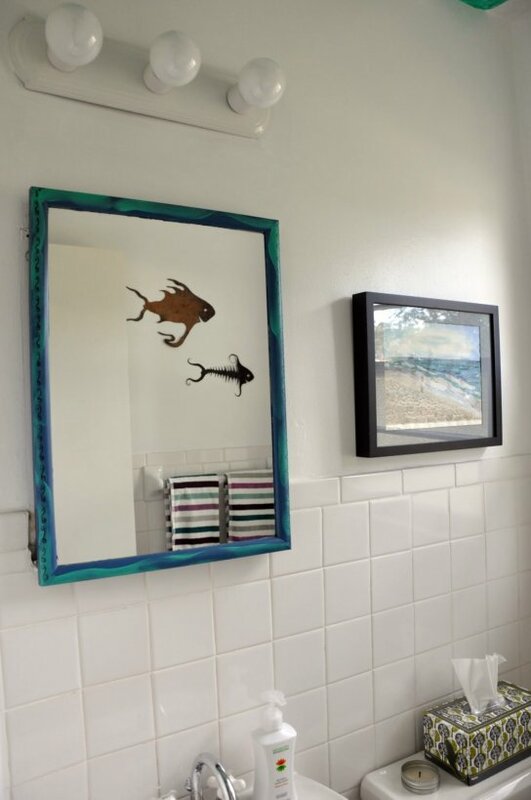 I added an ocean mixed media piece I did back in 2006 – keeping this bathroom sparse was my goal. 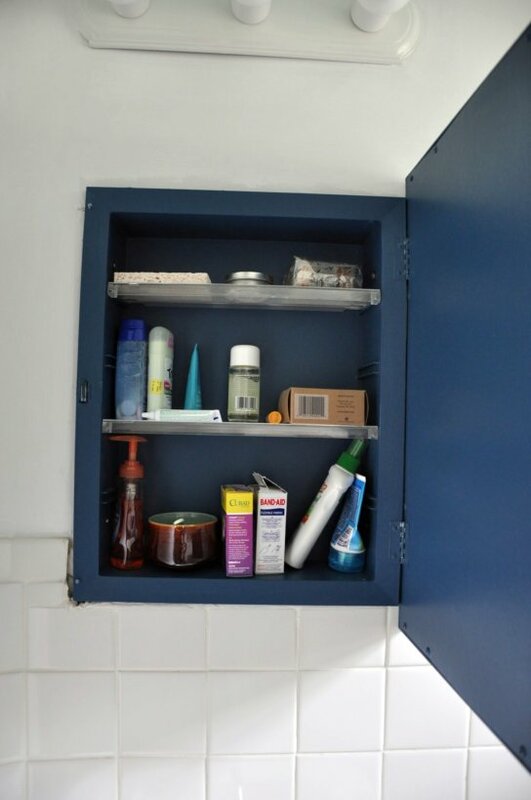 The cabinet’s interior is sharp in this deep blue. 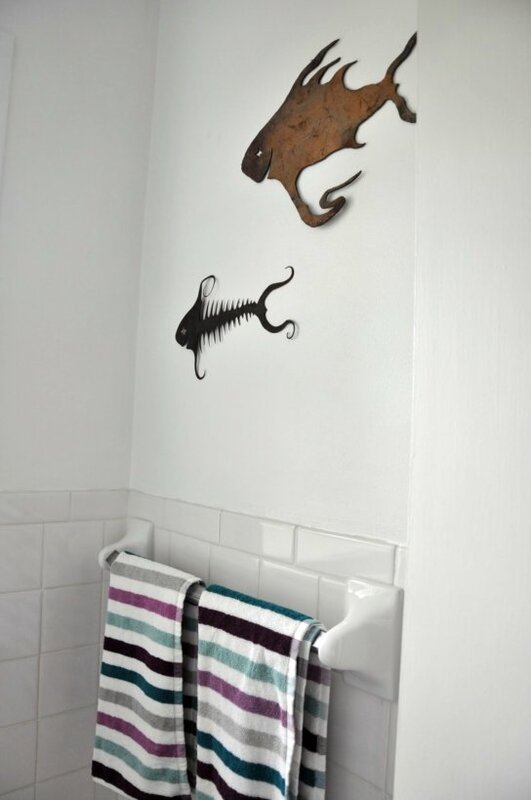 My Fishbones, in Greensboro, cut metal fish and two striped towels from Ikea rounded out the sparseness. My favorite part of this bathroom is the surprise ceiling mural. 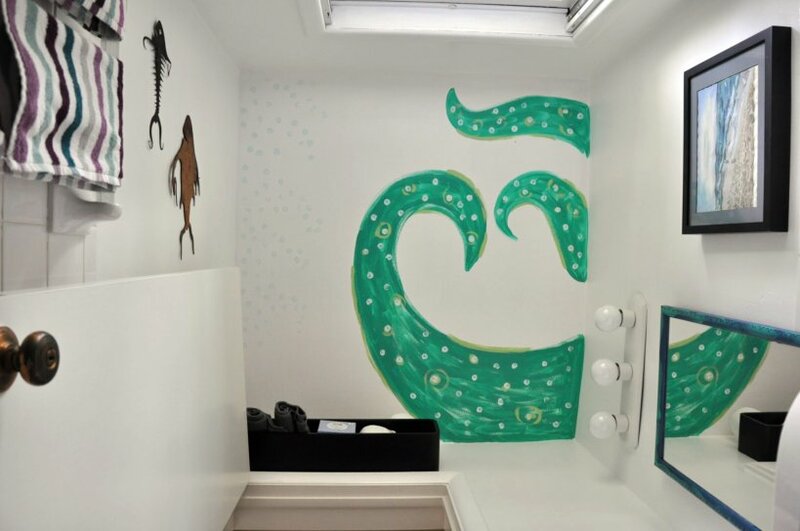 This came from the sea motif in this bathroom and a spark of inspiration one late night after Greta was in bed and Eric was out and about. I figured if he really hated it, primer would cover it nicely. 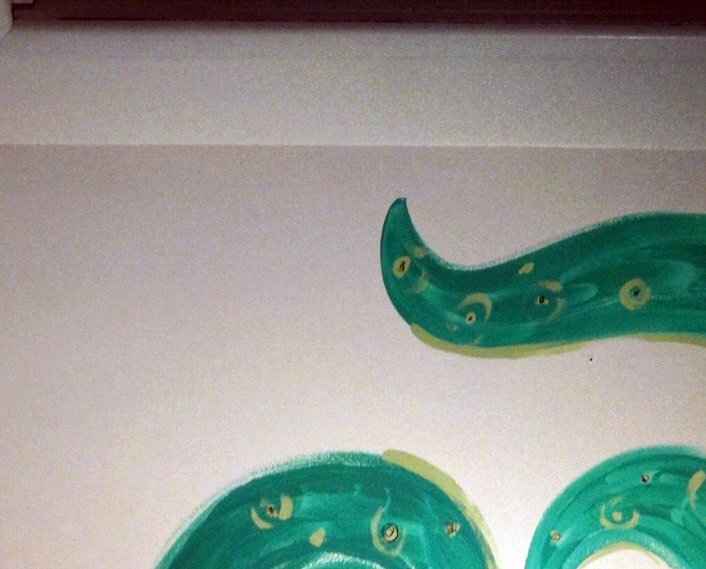 I used two samples for the tentacle paint. 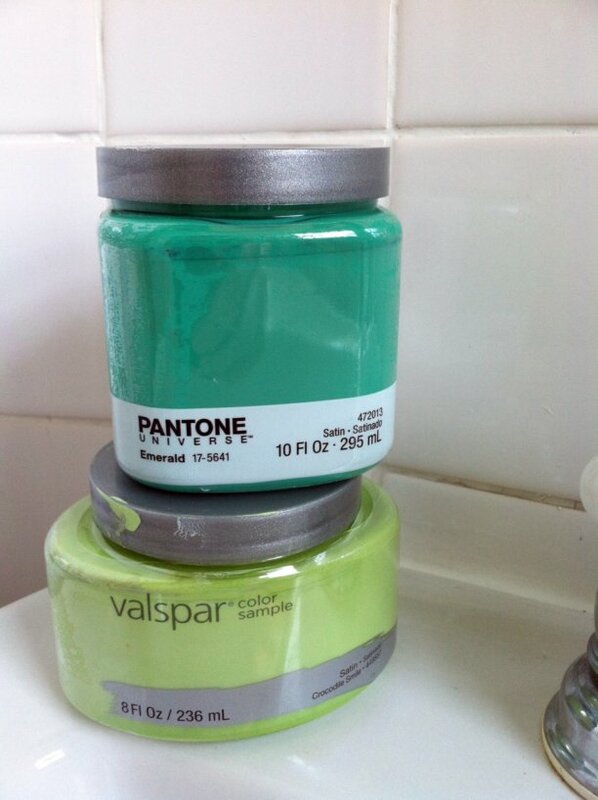 The top one is the Pantone color of the year – Emerald. I have plenty left over and I love this color, so I think it will end up in a few more places in our home. 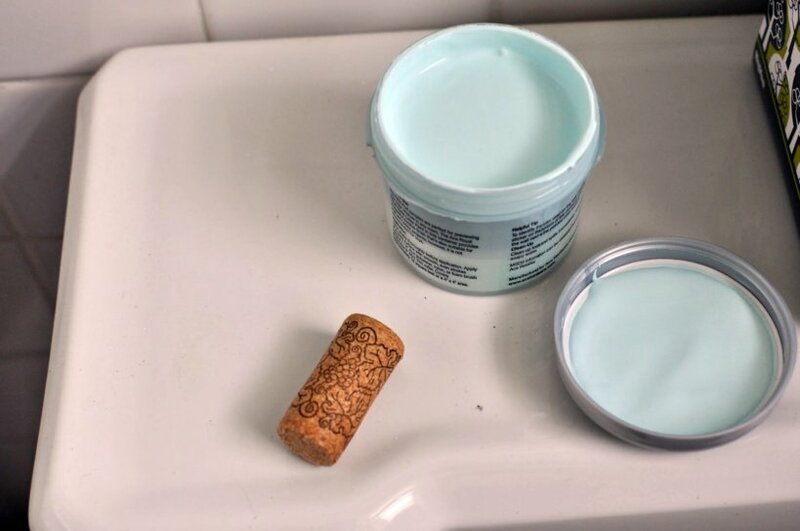 The bottom color is called crocodile smile and it is a summer 2013 Lowe’s paint sample. The Lowe’s sample looked better in the jar than on the ceiling, I think. This lovely light blue is a sample from Ace Hardware, called Grace Harbor. I used a cork to stamp the circular patterns on the ceiling. I love these little paint samples, they are a great way to test a color and excellent for small projects. 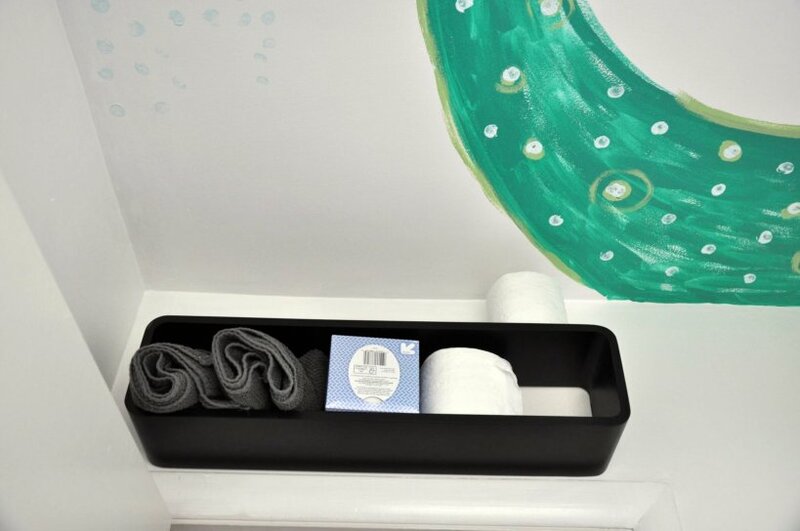 The last touch was to add a storage shelf above the door. 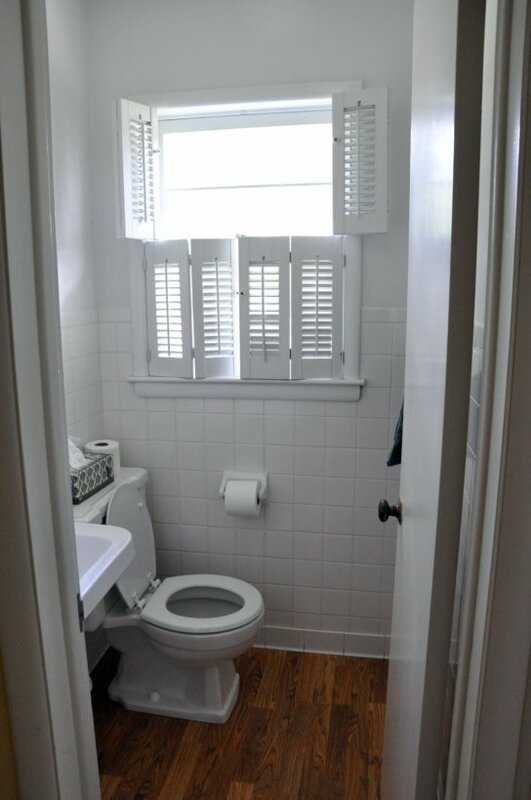 I have always thought this is a smart idea for a bathroom, especially smaller ones. It leaves no guests searching for t.p. or tissues. Greta’s hand washing stool is handy for short people like me. Yes, change is coming around here. The name of this blog is morphing over to Life Like Art in the next week. That means the new address will be lifelikeart.blogspot.com. 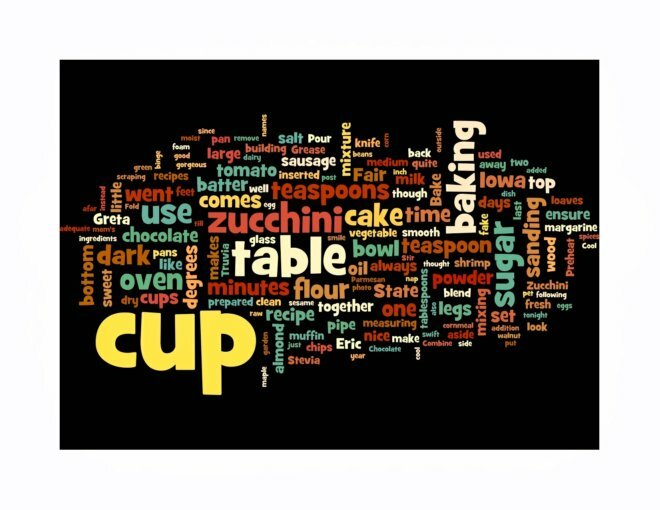 A wordle from Mommy’s Medley posts. Why? I chose the name Mommy’s Medley when I was just a few months into mommy-hood and while it was a great name, I don’t want mommy-hood to define this blog. It is about so many more aspects of my life. Hopefully Greta will understand. In the meantime, enjoy reading about what brings me so much joy in my life – the projects, the DIY time, painting, crafting, sewing, baking, cooking, family time, working on my house, and yes, being a parent. Oh boy, things are still busy around these parts. 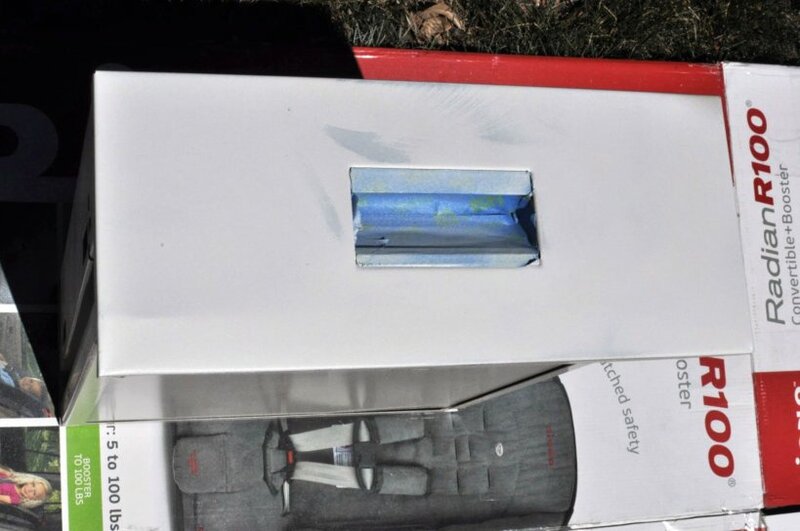 The latest spray paint victim was our mailbox. The thing was rusting and peeling away, see below. 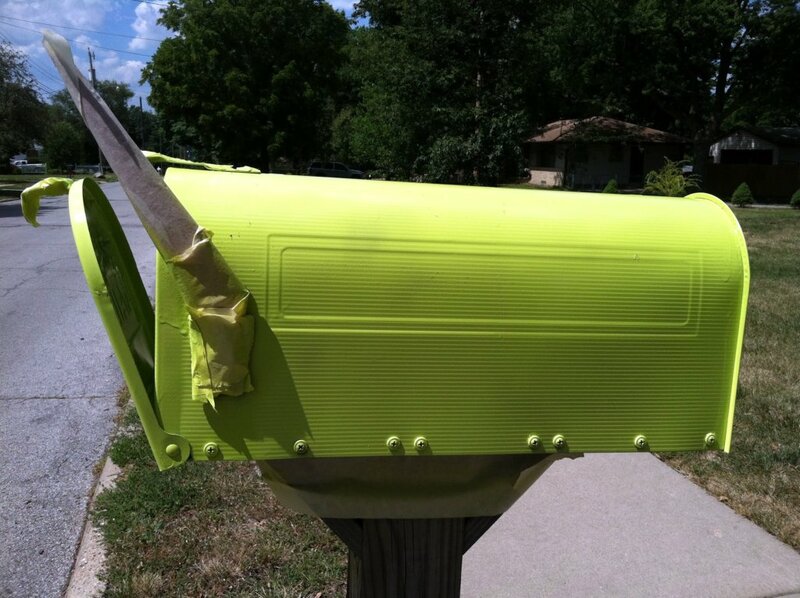 Nothing a couple coats of Key Lime green spray paint can’t fix! Seriously, what can’t spray paint beautify? Ugh. Before. I taped the flag, the wooden post, and the numbers (on the back side of this photo). The first couple coats shocked me a little, not going to lie. 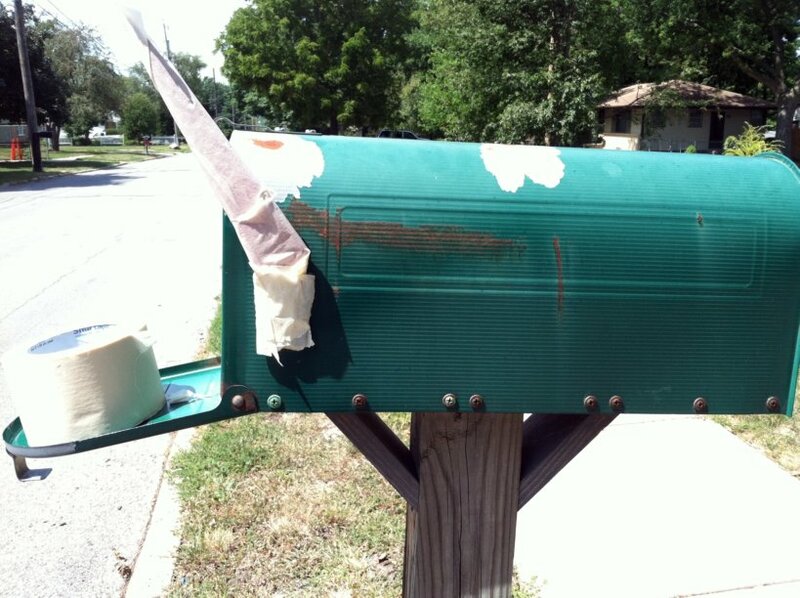 I started looking around the block wondering if the neighbors would think that the crazy art lady had gone too far, especially when everyone else seems to have a mailbox that is green, black, or brown. Eep. The color grew on me in the next 2 minutes. When it was dry, I added more reflective numbers, removed the tape, and am pretty sure it glows phosphorescently after dark. On my walk the next morning I did however, notice quite a few mailboxes with butterflies and odd murals. I guess my touch of Florida isn’t so bad after all. Other updates – outlets. 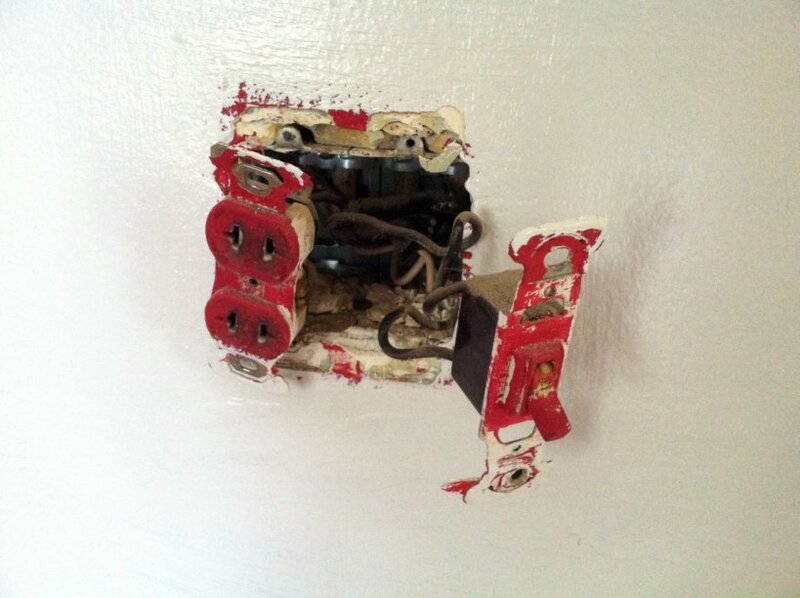 Replacing outlets and switch covers are such an easy way to update and clean up the look of a room. I still shudder at the previous color that drenched the living room and dining room. Egad – it made me nervous just being near that much blood red. 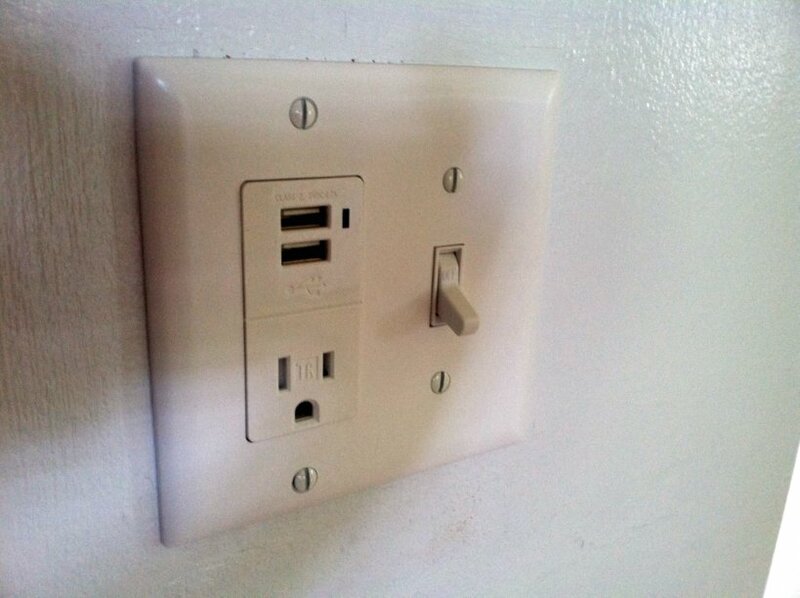 Eric had the genius idea of replacing the dining room switch with USB outlets for charging. Next step, add a pretty shelf and touch up the scuff mark seen below in this image. Coming soon – finished shots of the downstairs bathroom. You’ll either smile or shudder. Cornbread and corn muffins have and always will be a staple around my household – they were when I was a kid and will continue to be into Greta’s childhood. 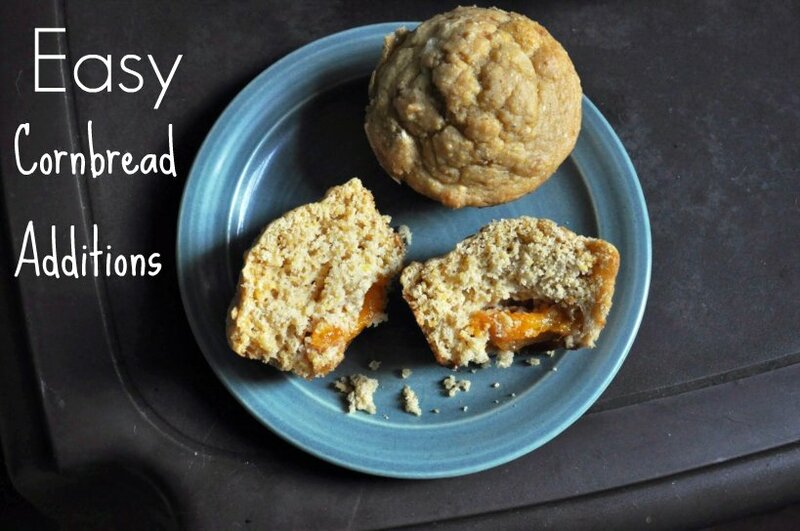 I have two recipes that are easy and quick – one savory and one sweet, but both easy as pie to make for a snack or meal. The first recipe comes from the need to use tomatoes. No, don’t worry, I will not go on a tomato binge like my previous zucchini posts. Though I admit, I am not done with zucchini recipes, merely resting from them for the time being. This gorgeous tomato comes from my mother’s garden, along with hundreds more. Tomatoes anyone? This dish is truly something worthy of a painting – soft and chewy on the inside with lovely bites of tomato and sausage (I opted for fake) with a crusty Parmesan pepper top. This is sure to please all – real or fake sausage. 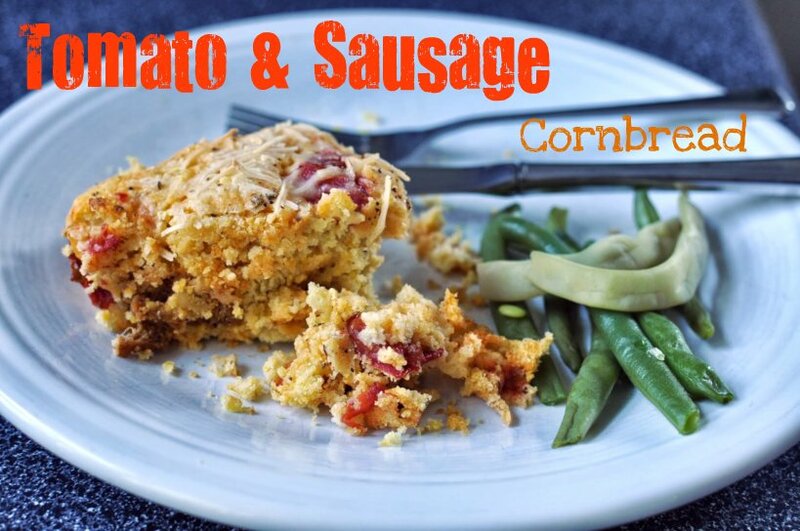 This was our dinner tonight – tomato sausage cornbread and steamed green beans. 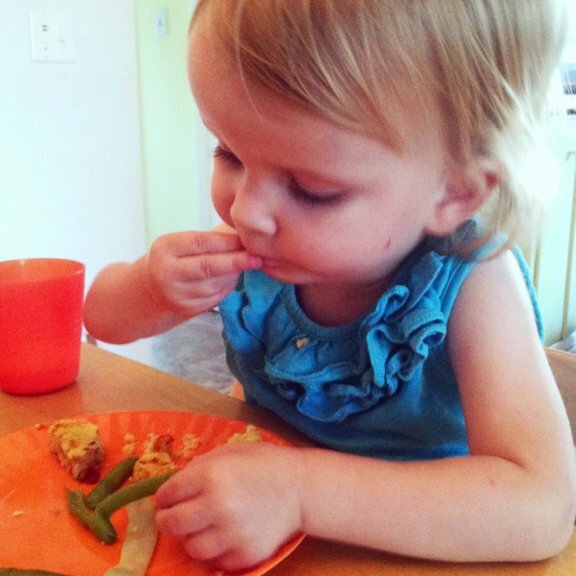 More mom’s garden vegetables – the green beans are so good this year. Greta asked me for seconds tonight because she helped me to prepare them! These sweet treats were born from a large quantity of fresh apricots on the verge of being non-edible in their raw stage. Necessity is the mother of invention, most certainly in the use it or lose game of baking and cooking. The addition of fruits and vegetables to cornbread requires a little more baking time – so watch the oven and use a knife to ensure you avoid doughy centers. 1. 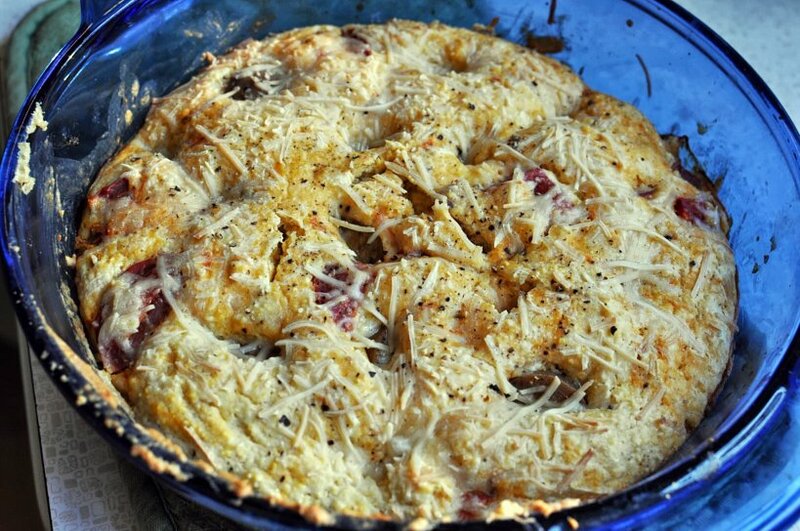 Grease a glass 8×8 inch baking dish with margarine, set aside. Preheat oven to 350 degrees. 2. In a medium bowl, mix together 1 cup cornmeal, 1 cup flour, ¼ cup sugar (OR 2 tablespoons Truvia Stevia blend), 2 teaspoons baking powder, and ½ teaspoon salt. 3. In a glass measuring cup, combine 1 cup (almond) milk, ¼ cup vegetable oil, and 1 beaten egg. 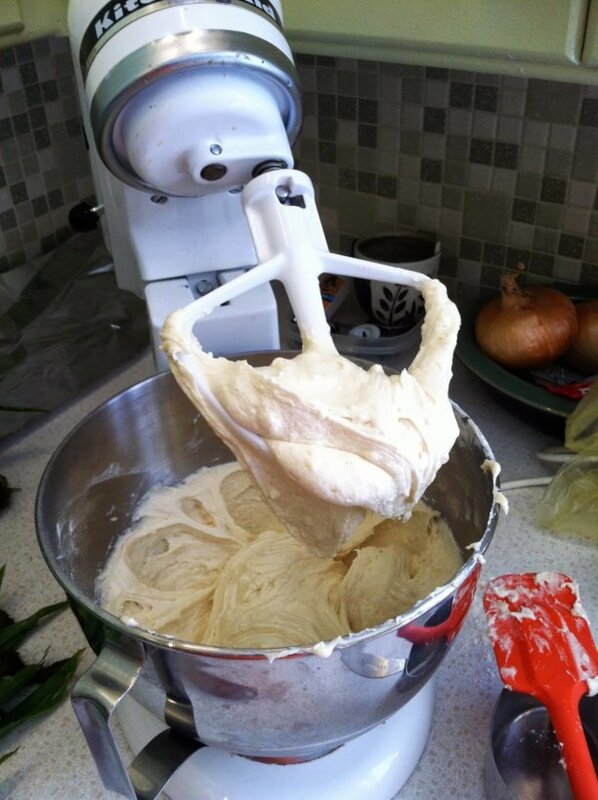 Combine with flour mixture in a few swift strokes, scraping the bottom of the bowl to ensure adequate mixing. 4. 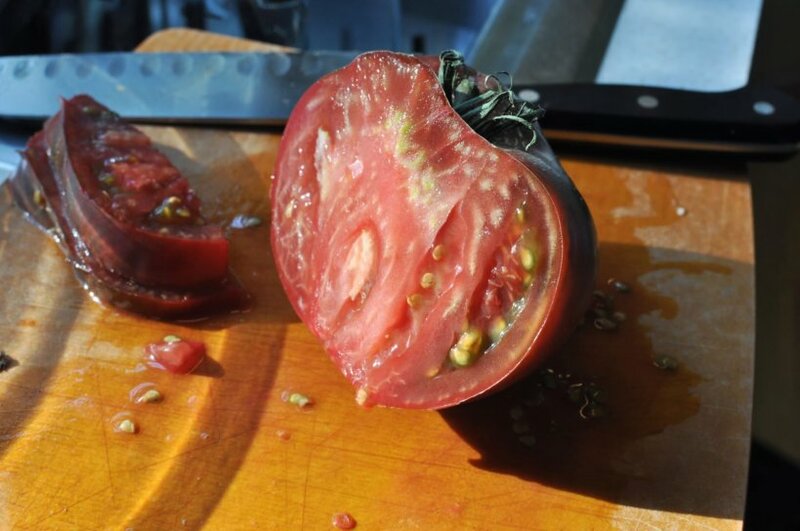 Chop ½ large or 1 medium tomato into ½ pieces. Dice 1 sausage (real or fake) into ½ inch wide pieces. Fold into batter. Pour batter into prepared pan. 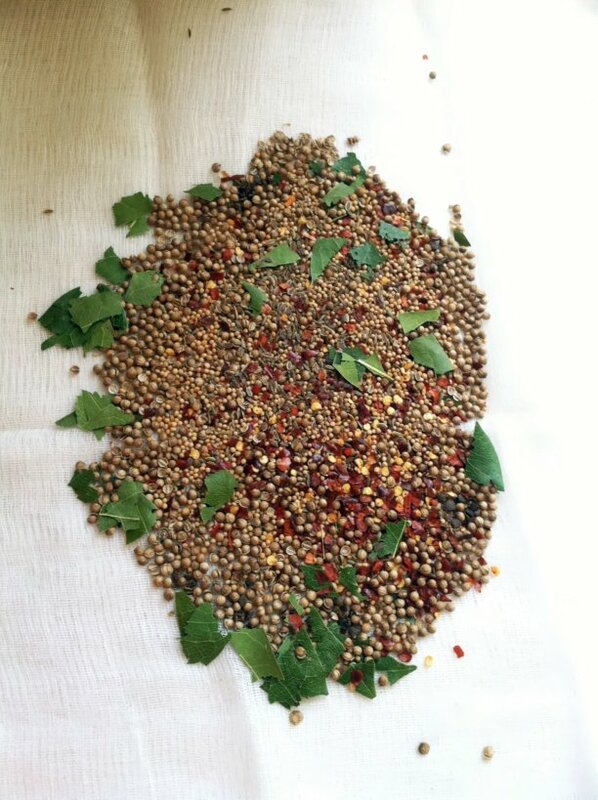 Sprinkle with Parmesan cheese and grate fresh peppercorn on top. 5. Bake at 350 degrees for 30 to 35 minutes, or till knife inserted in middle comes out clean. 1. Grease 12 muffin cups with margarine, or line with paper, set aside. Preheat oven to 350 degrees. 4. Cut in ½ and remove pit from 6 fresh apricots. 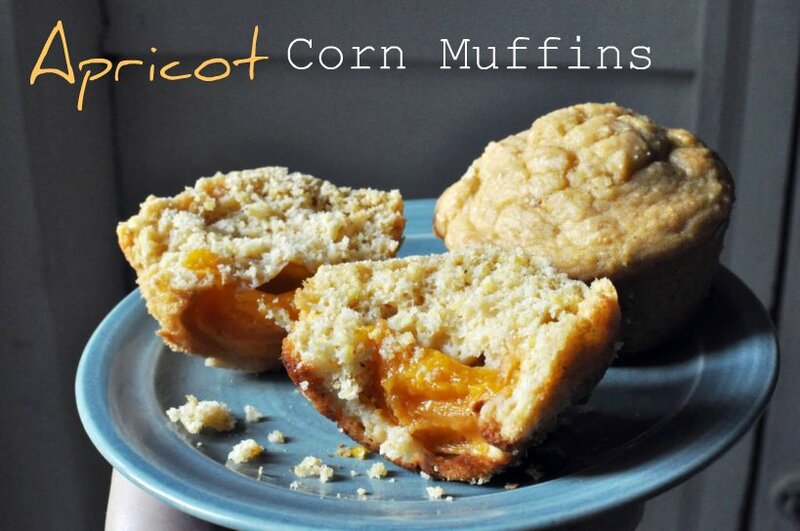 Place one apricot in the bottom of each muffin cup. Pour batter into prepared muffin cups. Getting an elementary art room ready has been consuming all my time here lately. Case in point, this post deals with events 2 weekends ago. 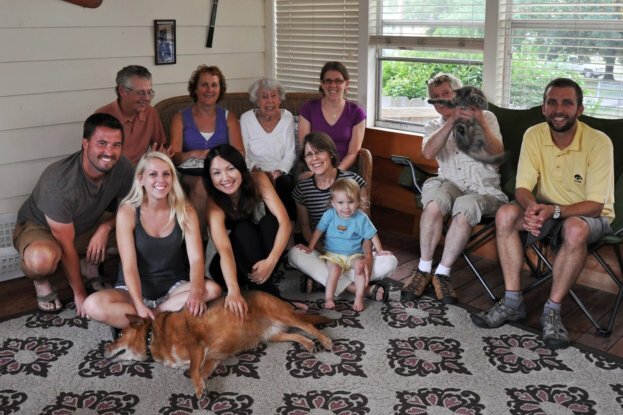 We had a gathering at our house to celebrate family from afar, from from nearby, and a friend who will be moving back to her home afar. Cooking for 10 can be tricky, but I pulled out the trusty shrimp boil. I used Martha Stewart’s shrimp boil because I love her spice bundle for this recipe. 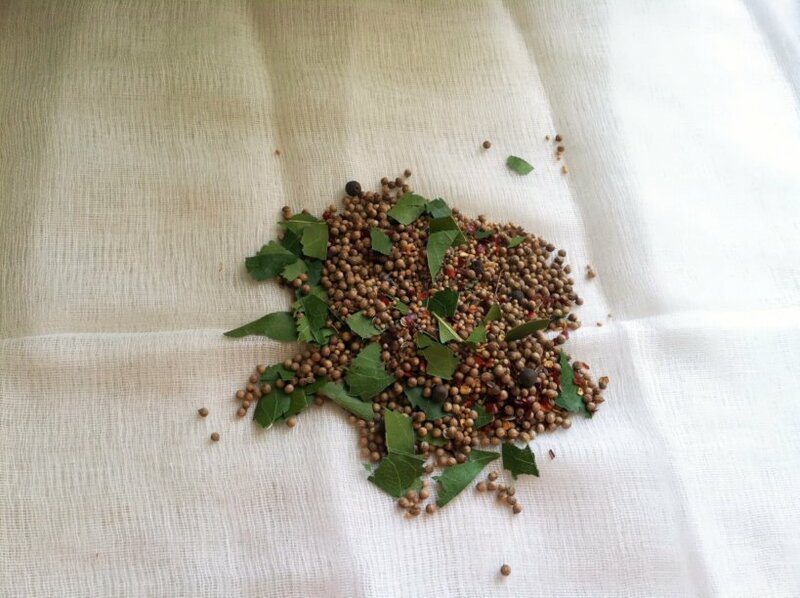 The spices are laid out on cheesecloth and then rolled with a rolling pin. I just thought they looked gorgeous. The flavor was complex and complemented the shrimp, potatoes, and Adel sweet corn well. The spices were good enough I could have drank the broth for a meal. These two photos just make me smile. 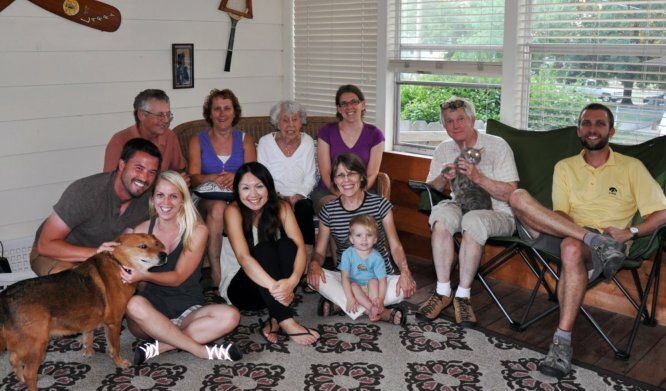 It was so nice to see everyone together from the west coast to the Midwest to Japan – even 2 of the 3 goofy animals were included! We had dessert and naturally I continued my zucchini recipe binge. 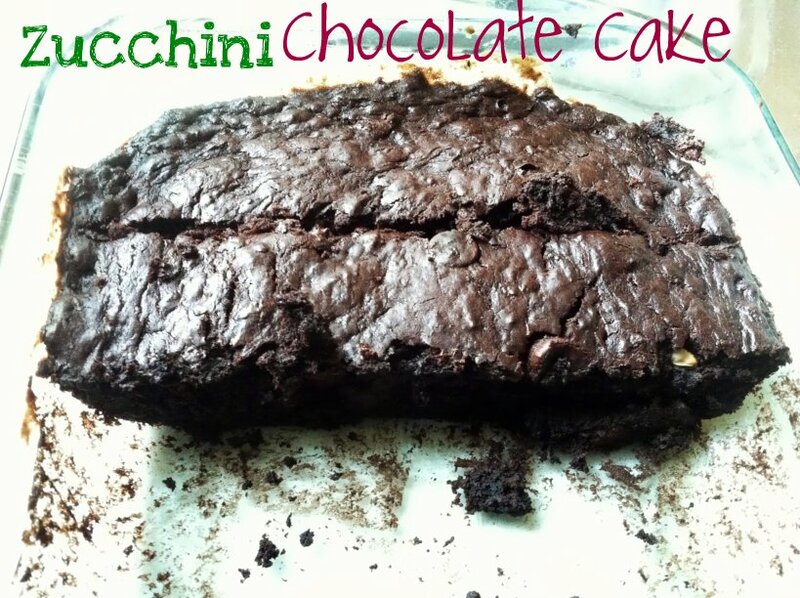 I figured out a sweet and chocolately way to use up zucchini – Zucchini Chocolate Cake from King Arthur. I did swap out and substitute a few things, see below for the less dairy & less sugar version. I went for a dark chocolate version with no milk or butter and Truvia Stevia blend instead of refined white sugar. This cake was so moist and aside from that little white seed that is visible in the bottom left corner, you would never know that there is zucchini in this cake! 1) Preheat the oven to 325°F. Lightly grease a 9″ x 13″ pan. 2) In a large mixing bowl, beat together 1/2 cup (8 tablespoons) margarine, 1/2 cup vegetable oil, ¾ cup + 2 tablespoons Truvia Baking Blend, 1 teaspoons vanilla, 1 teaspoon baking soda, ½ teaspoon baking powder, and ½ teaspoon salt until smooth. 3) Beat in 2 large eggs. 4) Stir in the ½ cup almond buttermilk (place 1 tablespoon lemon juice in measuring cup and fill to ½ cup with almond milk, allow to sit for a few minutes) alternately with 2 ½ cups flour. 5) Add ¾ cup dark chocolate cocoa and 2 teaspoons espresso powder, mixing until smooth. 6) Fold in 3 cups shredded zucchini (about 1-10″ zucchini) and 1/2 cup dark chocolate chips. Spoon the batter into the prepared pan. 7) Bake the cake for 30 to 35 minutes, until the top springs back lightly when touched, and it seems set. 8) To ice the cake: Slide the cake out of the oven, sprinkle it evenly with the 1 cup dark chocolate chips, and return it to the oven for 5 minutes, or until a cake tester inserted in the center comes out clean. 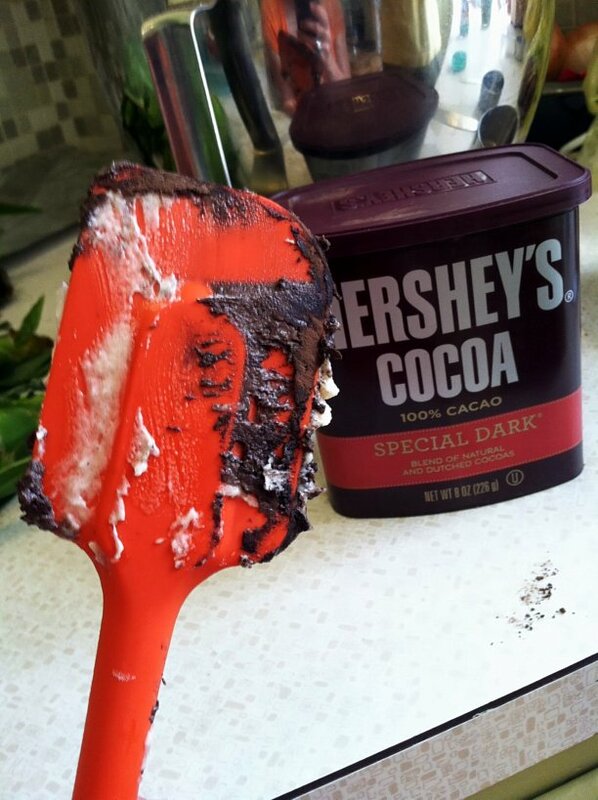 9) Remove the cake from the oven, and use a cake spatula or rubber spatula to spread the chocolate chips into a smooth glaze. Cool on a rack. The computer desk I have always dreamed about is finally finished! 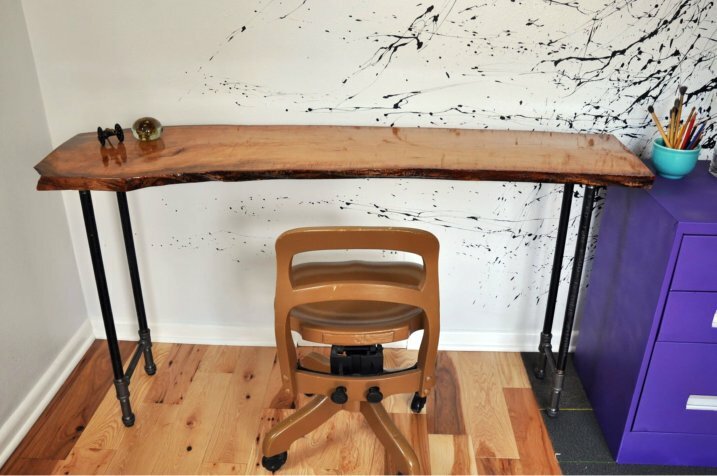 We went with a George Nakashima style with industrial pipe legs and ultimately, decided not to cheapen the look of the table by resting it on the purple filing cabinet. This also makes this table more versatile, should we ever want to put it to another use. In an earlier post, I told you one of our current past times was sanding. 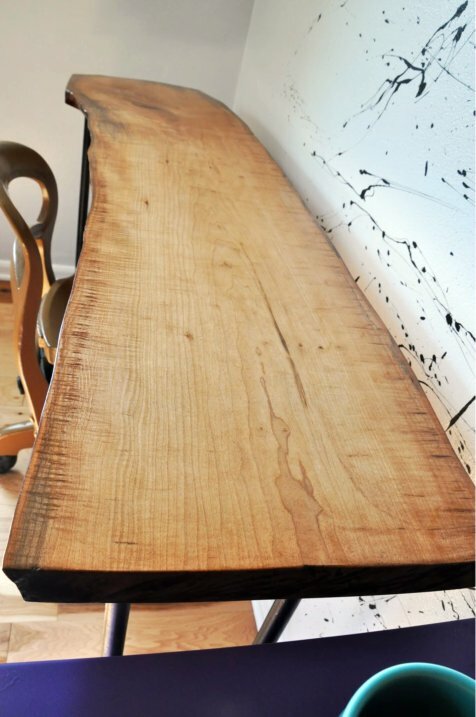 This table required quite a bit of sanding, as we chose a rough section of a tree. Eric inherited quite the collection of wood from his grandfather’s shop and we have been debating on how to use this wood ever since. Eric and I took turns sanding this section over a span of days – usually working during nap time or after G. went to bed. The sandpaper we used was 60, 120 and 220 grit on the orbital sander. Between coats of the polyurethane we used 600. This will be my next orbit sander – Bosch Orbit Sander Kit . After sanding until an almost glass-like smoothness, the walnut stain went on next. 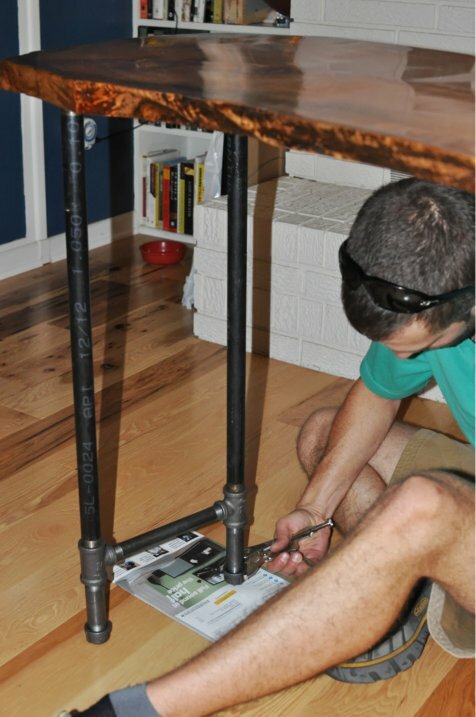 This is the underside of the table, which we stained first to ensure we liked the color. It did not get the same sanding as the top. The total cost for the legs was about $100. Quite sharp looking, no? We also added foam rubber pads to the feet to protect the floor. 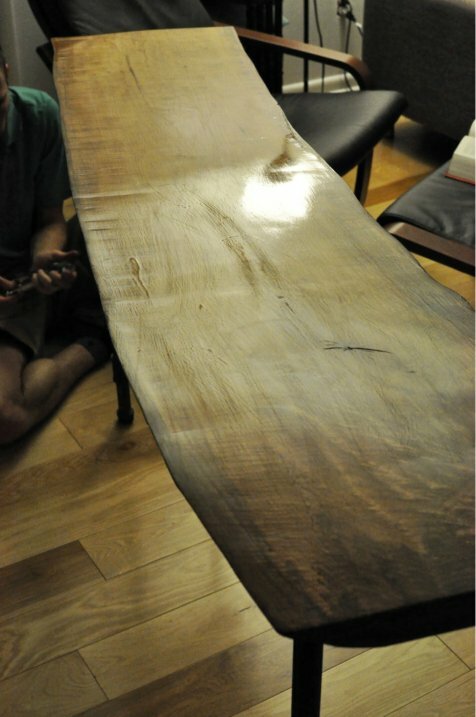 Although this photo is dark, it does a nice job showing off the glossy finish of this table. 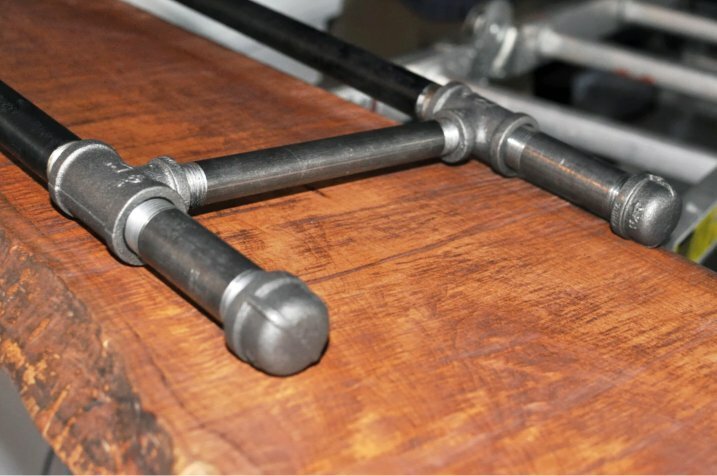 The finish is a Ace Hardware brand Polyurethane, the oil stain color is walnut. 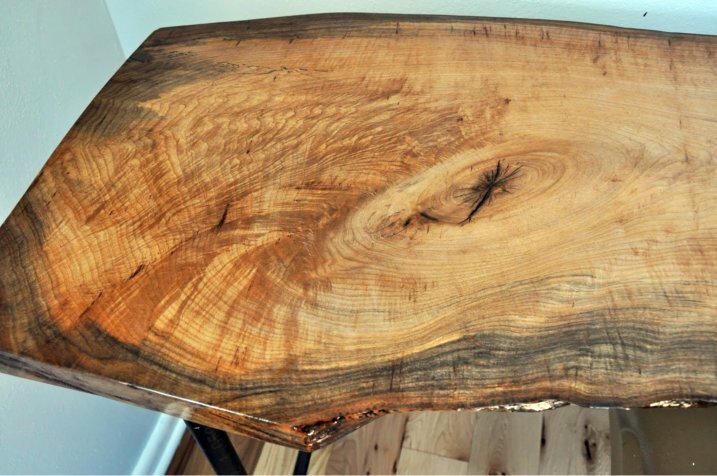 This is my favorite part of this table – this whorl in the wood. It was quite uneven and filled with saw marks at the beginning. Nothing a little intensive sanding couldn’t fix though. 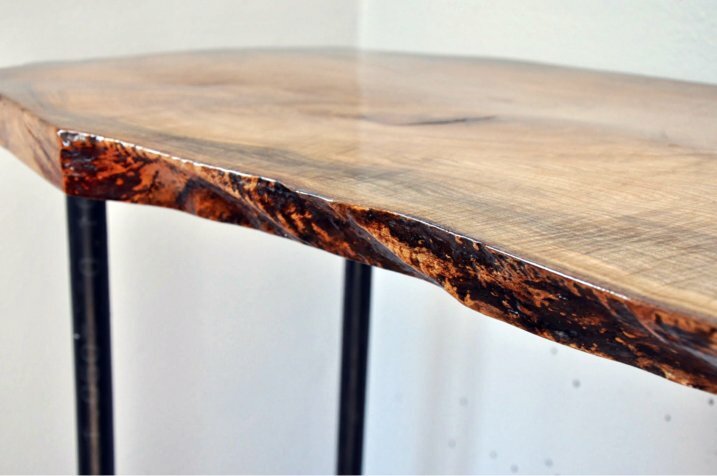 The edges are left raw on this table and the curve makes the perfect shape and fit for me in my retro office chair to belly up and blog away. 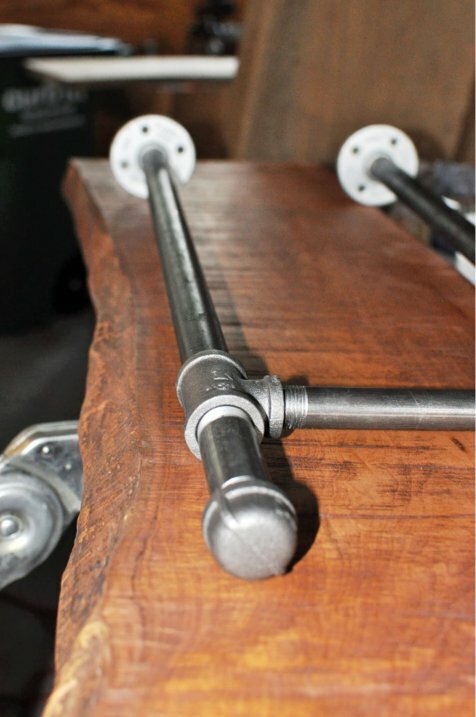 The flanges underneath are perfect – we debated whether or not to use them for the feet for added stability, however, at about $10 a piece, we will wait if the table seems at all wobbly before opting for additional feet. Oh how glorious it will look once everything else is set up. Next on the agenda is to set up the rest of my organizational items and the computer. It is still zucchini season! 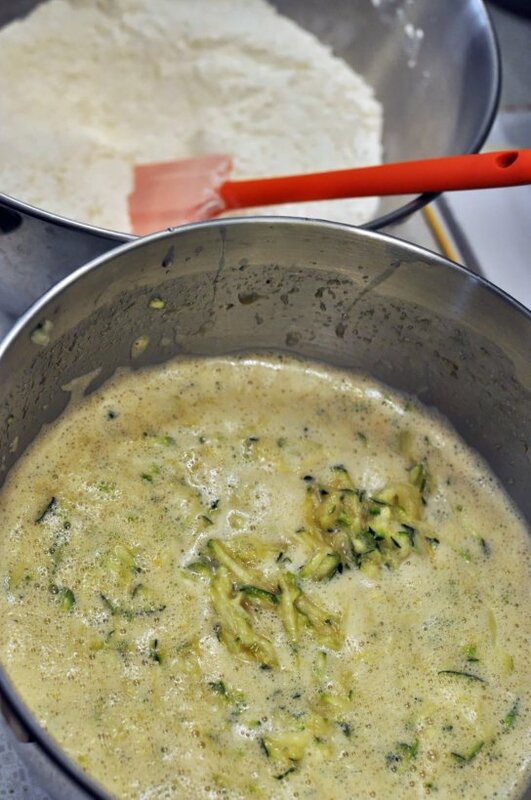 Here is one of my all-time favorite zucchini recipes for you – named after the friend of my mom’s that the recipe comes from. 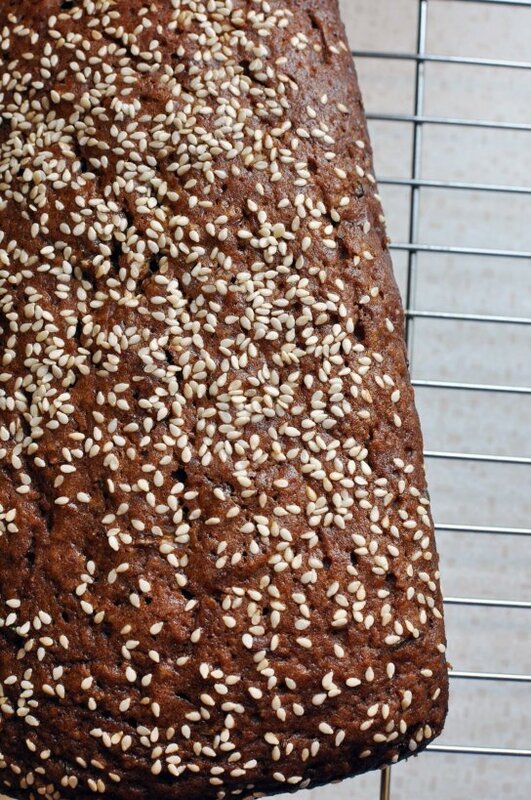 It’s moist and dense with a sprinkling of crunchy sesame seeds on top. I made a double batch the other day and gave some away. However, I committed a cardinal sin in baking and did not taste it before giving it away. I thought it was a tad on the dry side – I am still trying to figure out my new oven. Sorry if yours were at all dry like mine were! The liquids will foam like this. I substitute half the sugar for coconut sugar in this recipe. The final loaves will have a nice dark crust on them. Give them time to cool at least a little – it’s easier to slice them then. 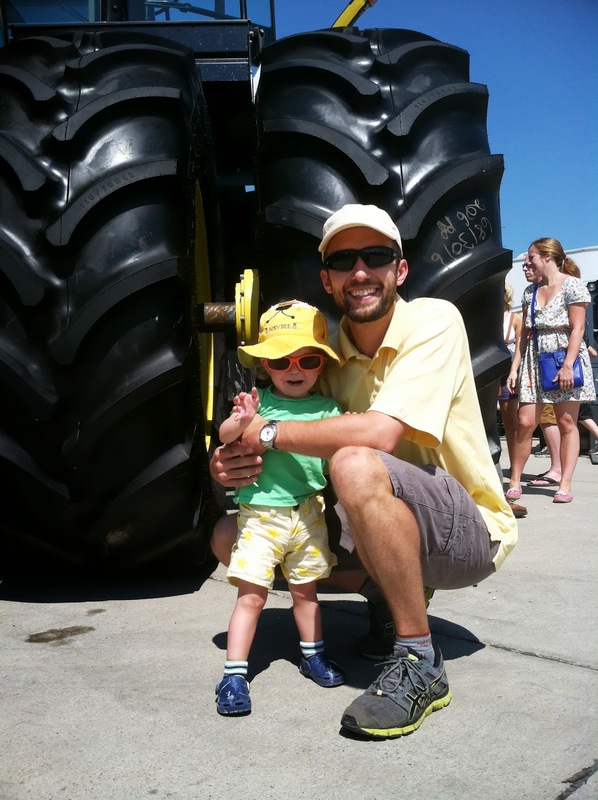 In other news, we have been to the Iowa State Fair twice in the last two days. 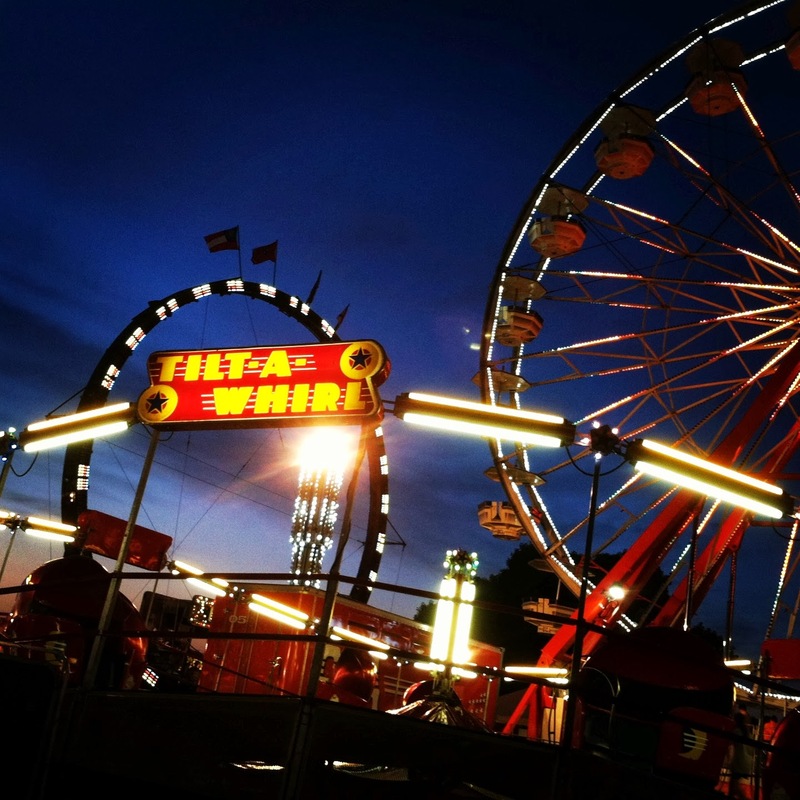 This year’s theme is Happiness is….The Iowa State Fair. It nice living here and not trying to cram it all in to a few days as we did last year. 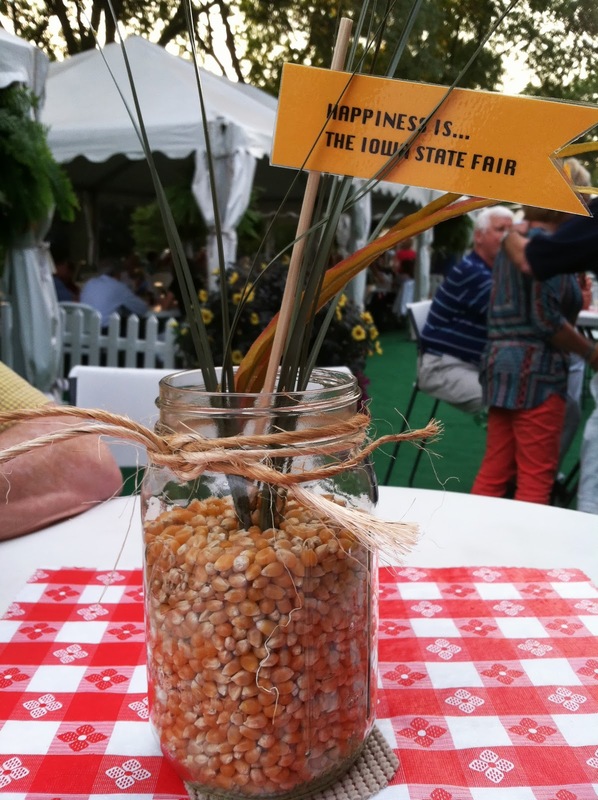 We went to an Iowa State Fair Party on Friday night and these were the cute table centerpieces. 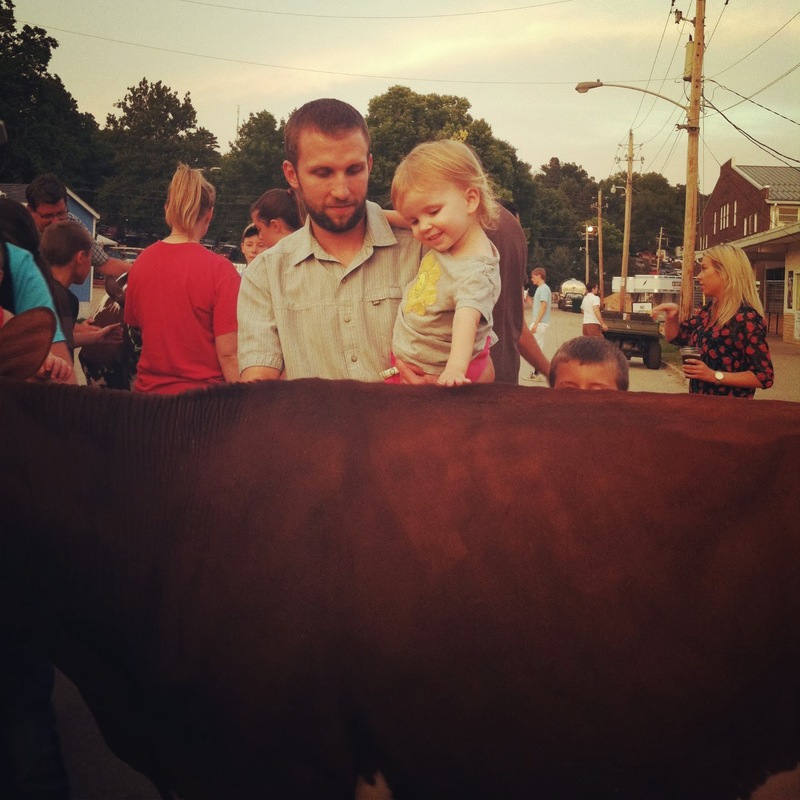 Greta was eager to pet the dairy cows outside the Dairy Barn, which have the best milkshakes! 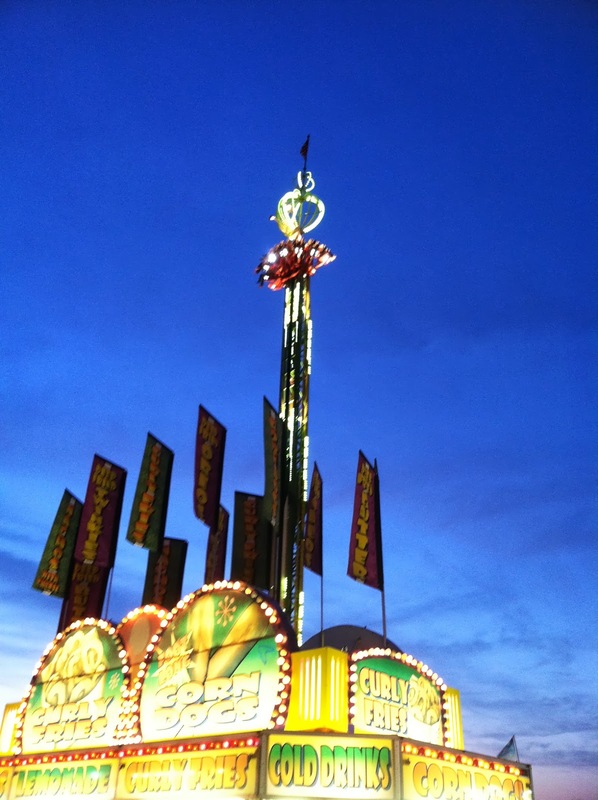 It’s been ages since I was last at the fair after dark. 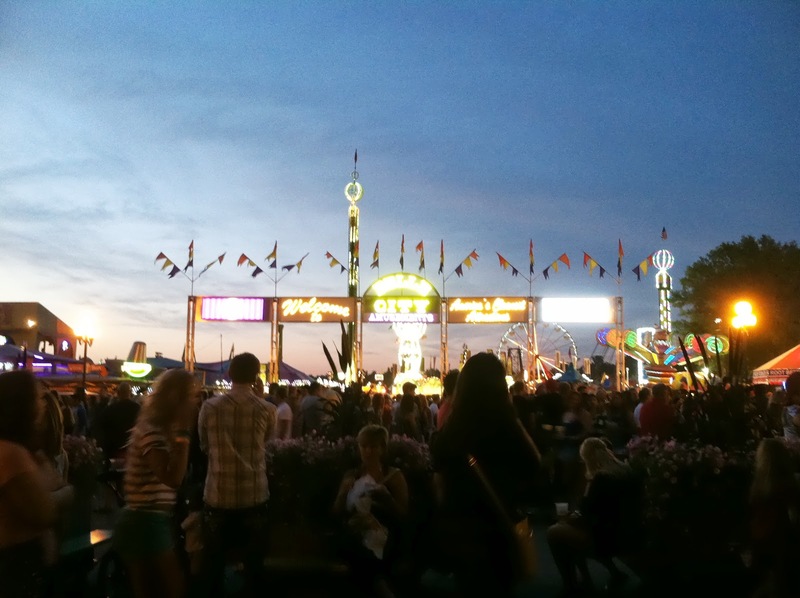 This Iowa Craft Beer tent has been a fun addition to the more recent fairs. 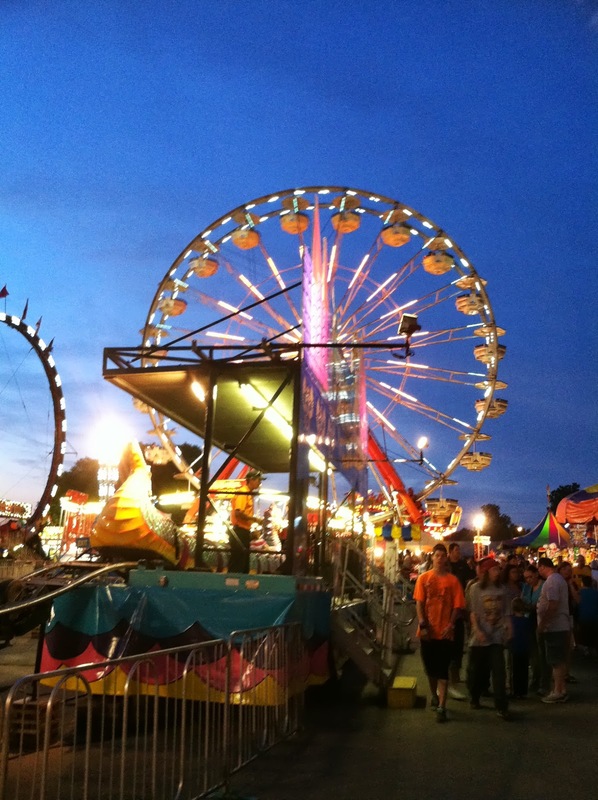 The Midway was lit up with lights and over primped teenagers. We went a second time this morning and hit up more of the buildings. 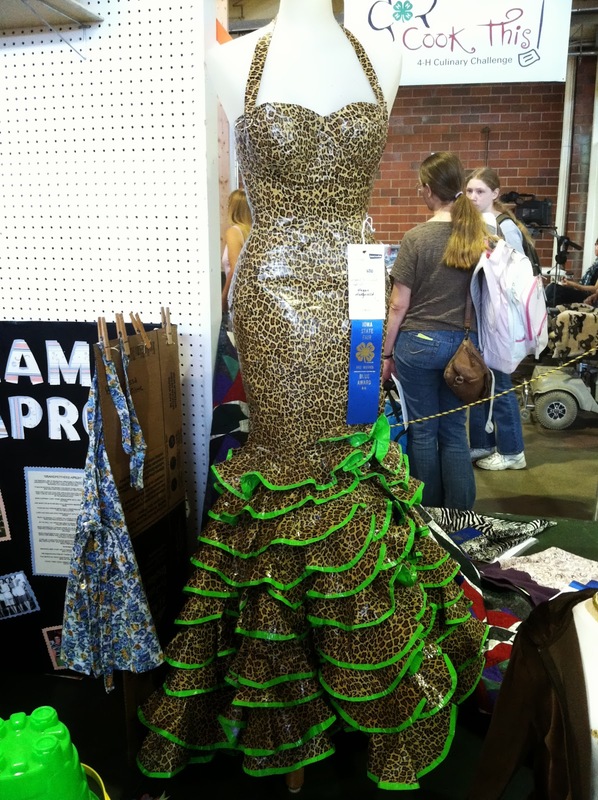 The 4H building is always one of my favorites. If you know my sister and my maiden names look for a brick with our names on it on the ground outside this building. We both put in 9 rewarding years of 4H. Greta, as always enjoyed the tractors. She was nearing nap melt-down here though, and screaming, “Mommy, no cheese!’ at me. As in, no, I will NOT smile for you. 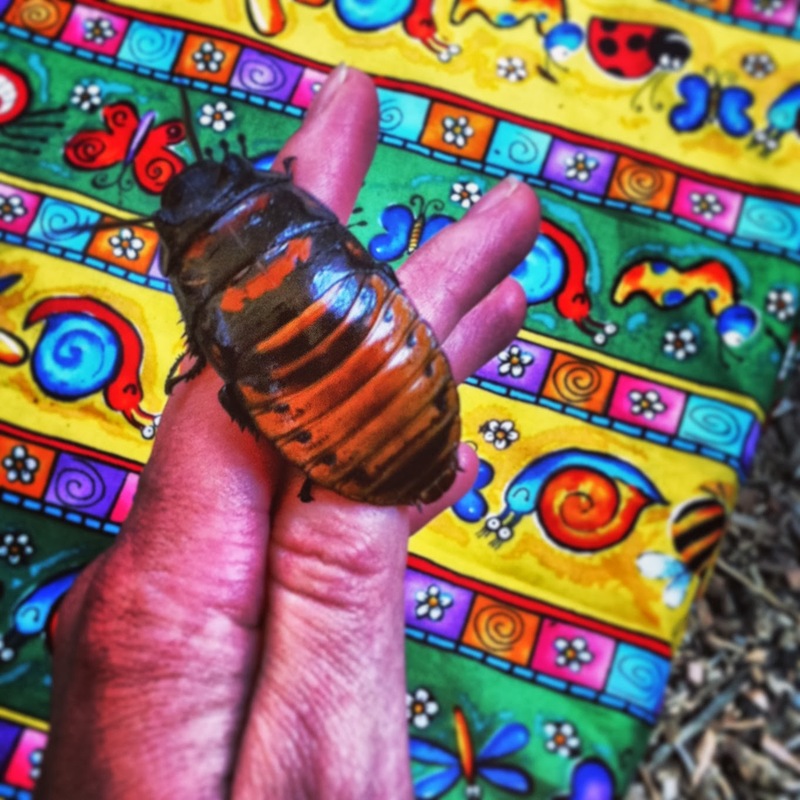 We found Madagascar hissing cockroaches at the DNR building. Greta let me hold them but refused to touch them herself. She did pet the tarantula though and was very proud of that moment. 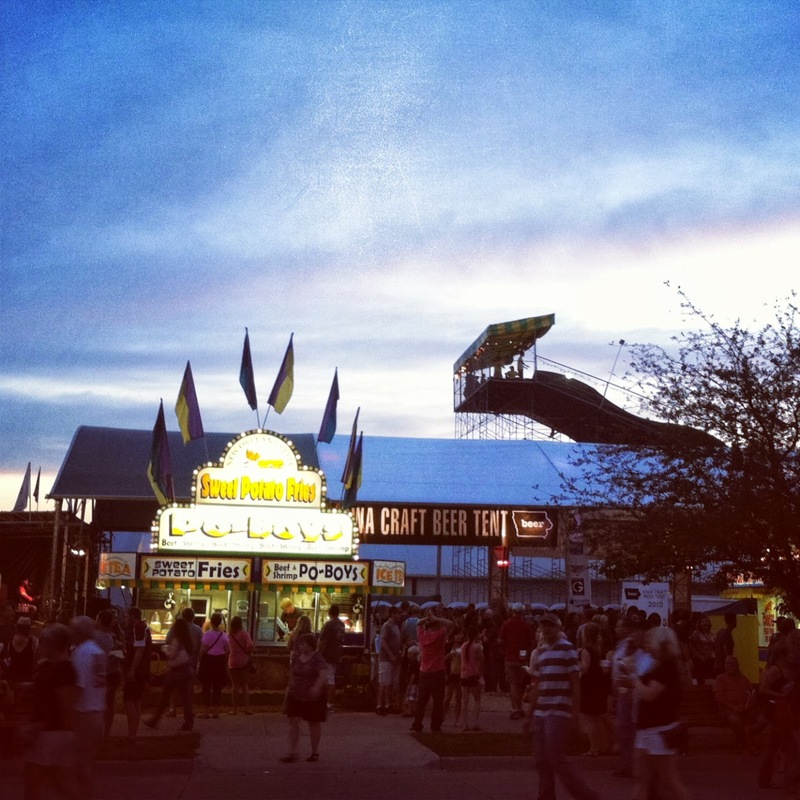 Hope you can make it to the Iowa State Fair, but if not, check back for more fun 2013 Iowa State Fair moments in the days to come. 1. Mix 1 cup oil, 1 cup sugar, 1 cup brown sugar, 3 eggs, 3 teaspoons maple flavoring or maple syrup together in a bowl until mixture is thick and foamy. 2. Shred 2 cups of zucchini and add to sugar mixture. Stir well. 3. Mix together 2 ½ cup flour, ½ cup wheat germ, 2 teaspoons baking soda, 2 teaspoons salt, and ½ teaspoon baking powder. 4. Make a well in dry ingredients, add wet ingredients and stir until blended. Grease and flour 2 loaf pans. Pour batter into pans. 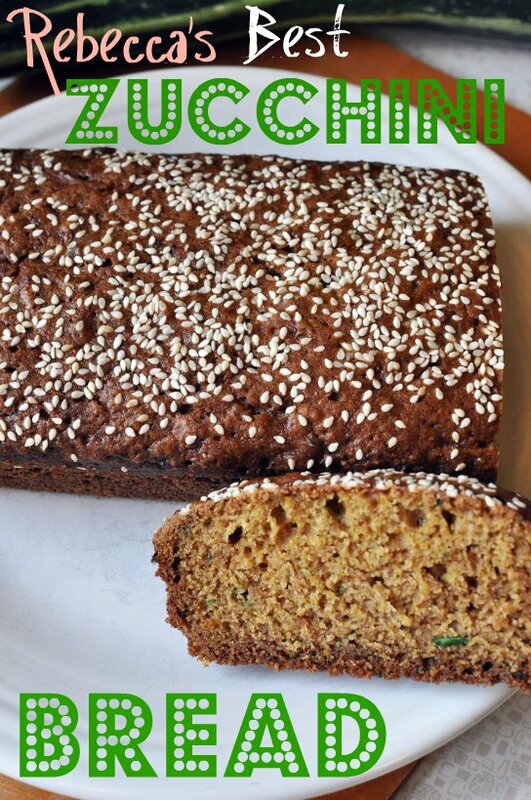 Sprinkle tops of loaves with ⅓ cup sesame seeds. 5. Bake at 350 degrees for 1 hour. Cool 10 minutes in pans and then remove. Slice when cool. This project was the most fun project I have completed in a while. It’s also the first project I have completed in a while, though. I am excited to share this with you! More on that fun splatter wall later. 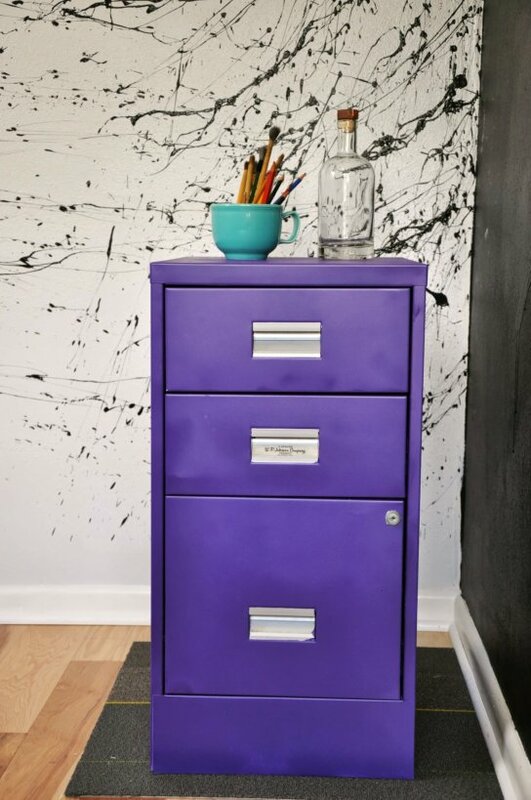 This file cabinet was yet another Goodwill find – the price tag says $5.99, but all furniture was 50% off that day, so I snagged it even cheaper! 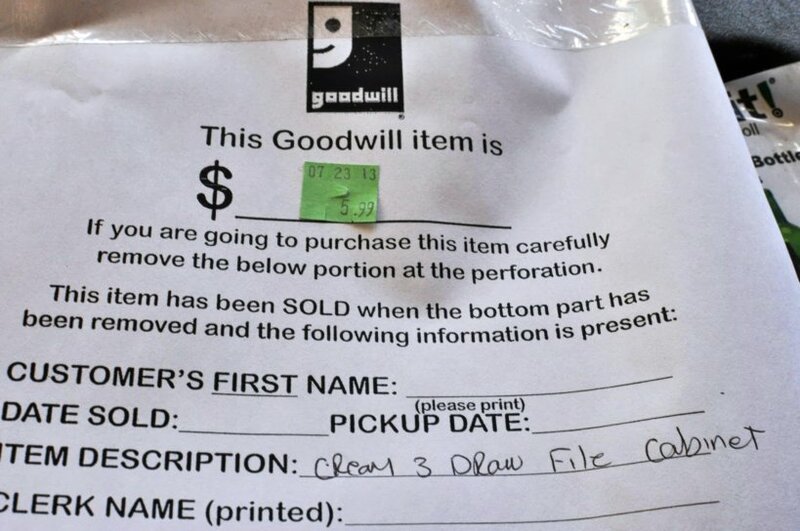 I originally went to an office supply store and almost had a heart attack at the price of new file cabinets – I guess I had no idea that they could be so pricey. Here is the before shot. The back side had a few small rust spots and there was one small dent on the front that needed to be dinged out, other than that it was in great shape. 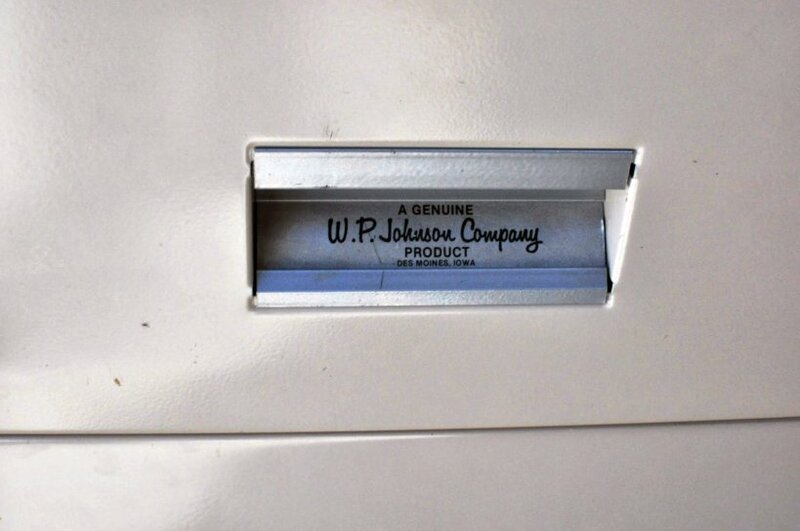 One of the things I really liked about this file cabinet was this tag on the middle drawer. 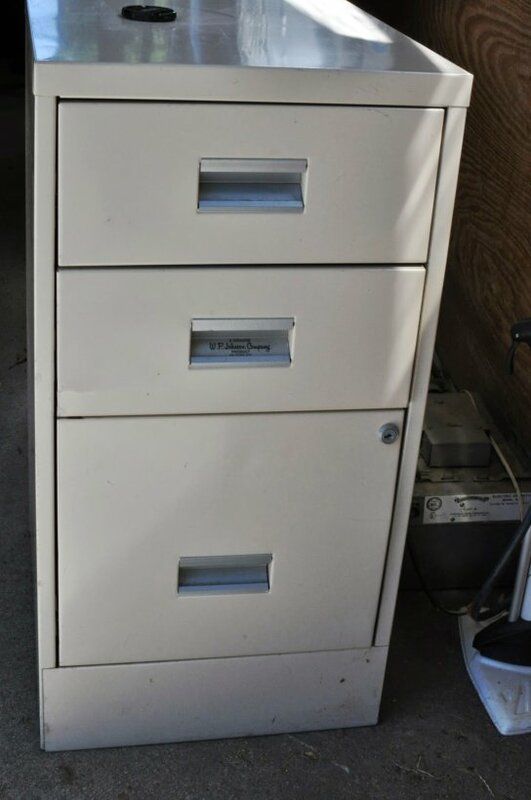 It is a locally made file cabinet! I started by sanding the entire file cabinet – front, back, insides, and outsides. I started with an orbital sander that had way too coarse of sandpaper on it and ended up with a lot of sparks and the silver marks you see above. Oops! 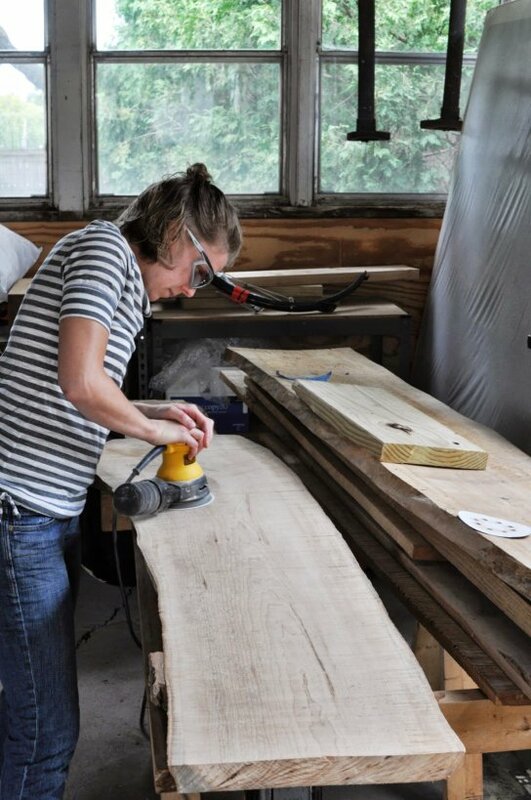 I then changed methods and sanded by hand – this was easier to get into the small areas. After sanding, I wiped the entire cabinet with a wet rag and allowed it to dry thoroughly. Next, I primed the cabinet with two coats of white spray paint. Notice I taped the handle pulls with painter’s tape, because I wanted to preserve my Des Moines sign and the silver color of the pulls. After the white base coat was completely dry (read the label on your spray paint), I moved on to the color coats. 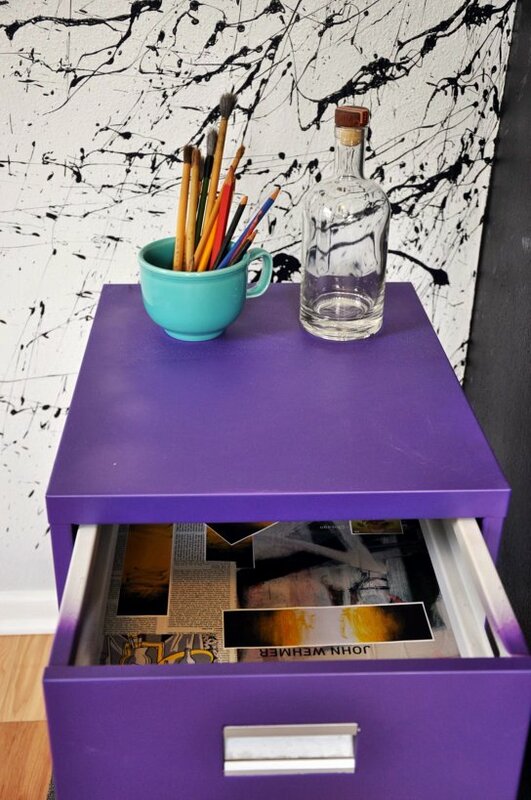 I chose a vibrant purple, Valspar Purple Satin Premium Enamel Spray Paint , to make this file cabinet more interesting. Our house has much more subdued colors than the previous house, so I am using furniture and accent pieces for punches of color. 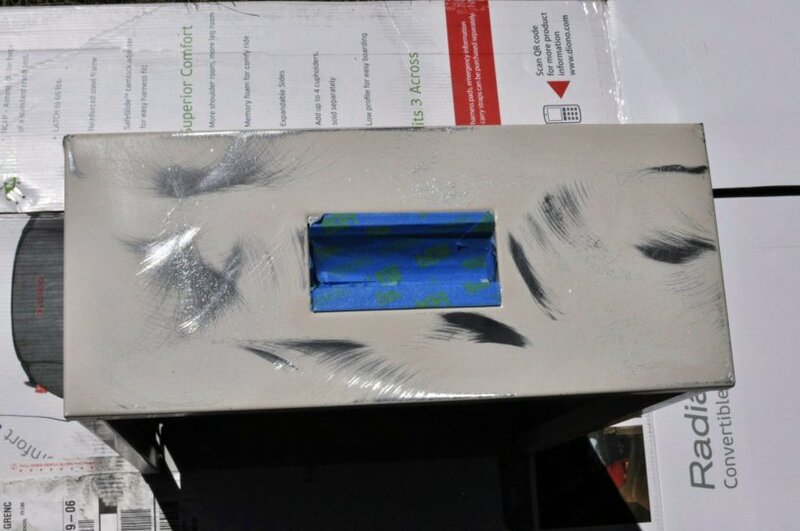 I always use large pieces of cardboard for spray painting – they do not blow around like plastic and paper do. 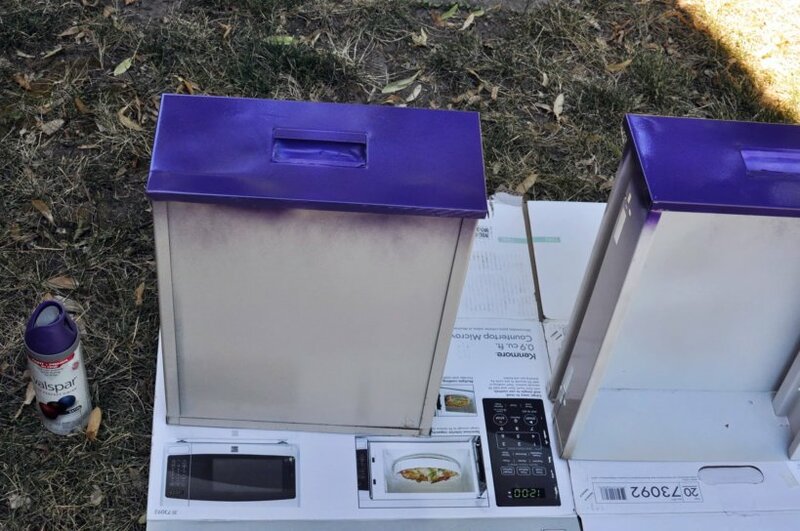 Be sure to keep your coats of spray paint even and thin. 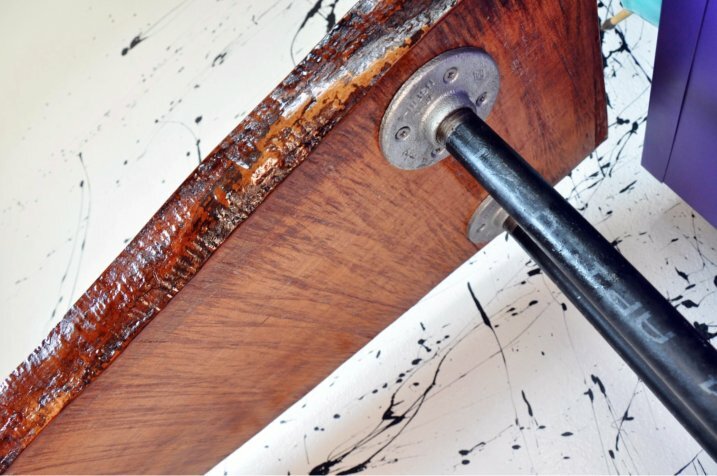 Thick coats will cause drips and runs. 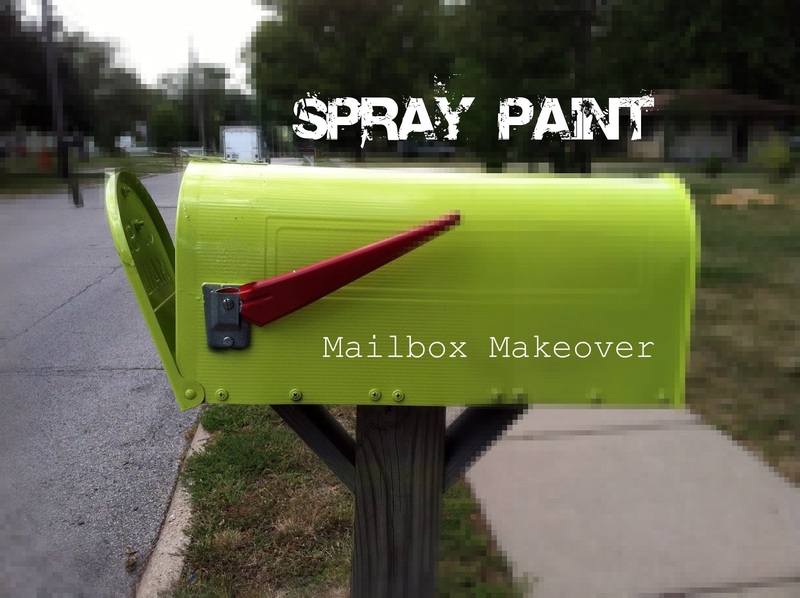 Allow for dry time between coats – always read the label on all spray paint! 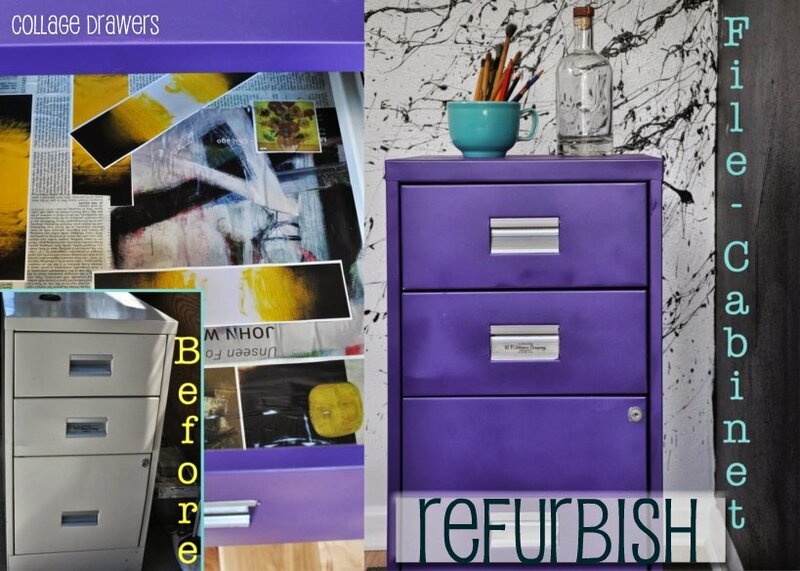 After allowing the purple paint to dry completely, I moved the file cabinet into the office space. I got right to work on the insides of the drawers. 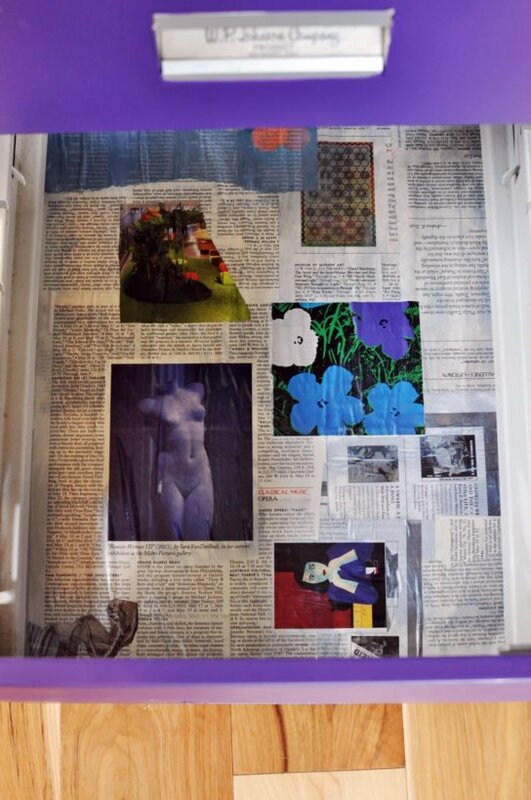 I opted not to paint them, but instead to use Mod Podge and magazines to create a collage lining. I cut out all my pieces first and arranged them just how I wanted them. 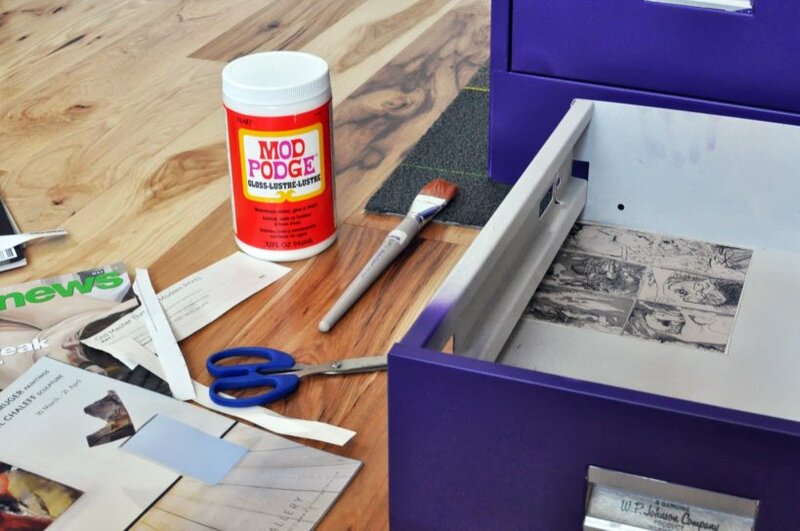 Then, I brushed Mod Podge on the drawer itself, laid the pieces on top, and finished with a top coat of Mod Podge to seal it and make it glossy. TIP: Running the edge of an old credit card over the paper will remove wrinkles and make the paper lay smoother. Each drawer is different. 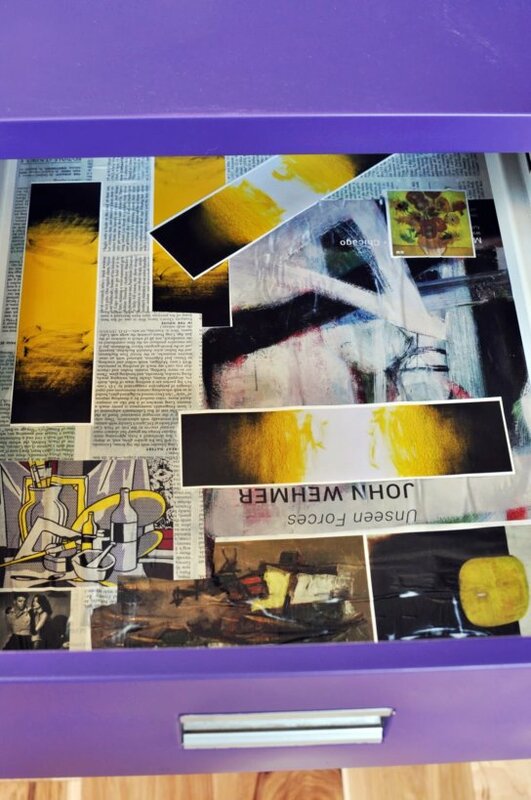 This is the yellow and black drawer with themes of Abstract Expressionism and still life images. 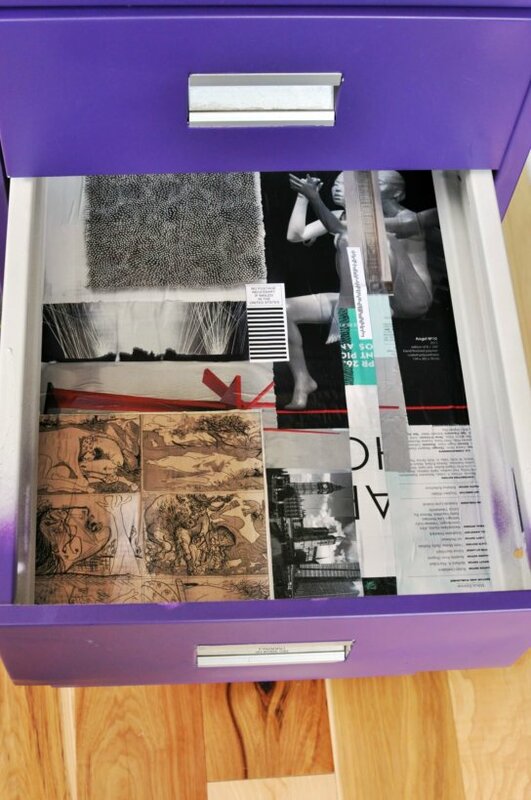 I used two magazines for these drawers – The New Yorker and Art News. This drawer is the monochromatic with accents of red & green complementary. What on earth will I do if magazines and newspapers ever go totally digital?! Collage and papier-mache may die out completely. Support your local paper artists and continue your magazine and newspaper subscriptions! This drawer is the text drawer with predominantly cool colors. I got to work organizing the file cabinet next. 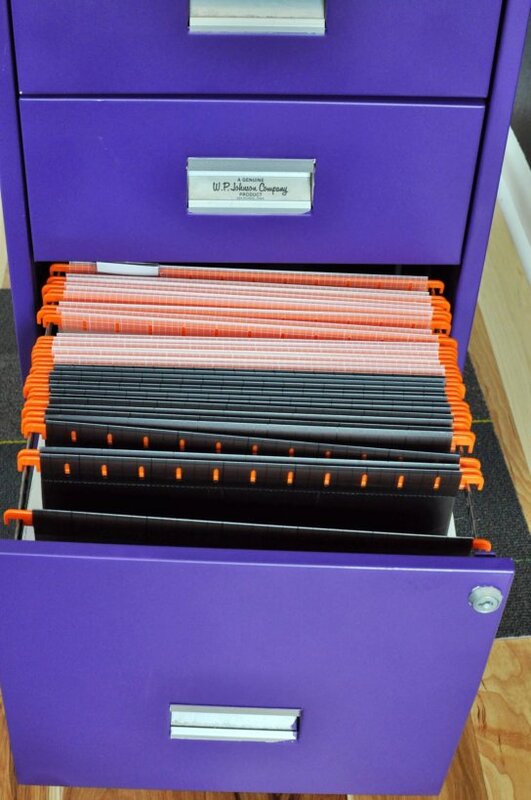 We picked up some handy hanging file folders from Ikea last weekend. 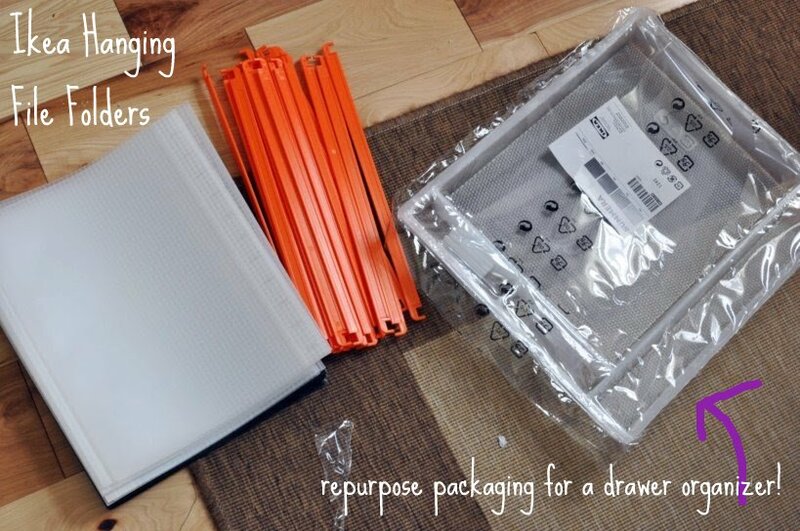 The packaging worked great re-purposed at a drawer organizer, too. Heart be still! That orange! Love it with the purple even more. The file cabinet is all ready for the next stage – it’s pair – the wood computer desk. This room is on its way to being my creative sanctuary – can’t wait to show you more. 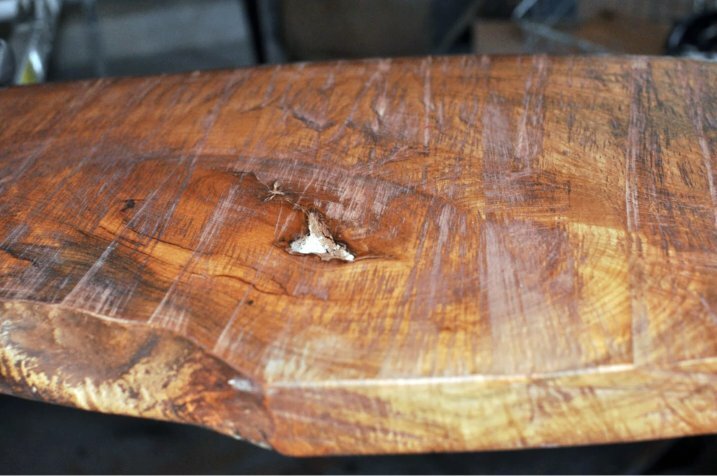 I’m off to sand wood and, hopefully, seal the table top soon.